Want to resurrect an old PC that's collecting dust? Wish you could insta-boot your laptop or netbook for a quick peek at your e-mail or a Web page? Presto promises exactly that kind of convenience. It's a compact, fast-loading Linux OS that installs in Windows XP or Vista (no pesky boot CDs to burn) and runs alongside it. Tthe installer adds a dual-boot menu to your system, so you can pick which OS to run at startup. In other words, Presto gives you the fruits of Linux without the usual hassles. I've been test-driving the OS for the past couple weeks, and I'm seriously impressed. It has its limitations, but it definitely succeeds in delivering the most accessible Linux OS ever--and perhaps the fastest. I installed it on a two-year-old Acer laptop, which takes a good 2 minutes to boot Windows Vista. Time to boot Presto: under 20 seconds. The OS comes preloaded with some basic apps, including Firefox, OpenOffice, Skype, and the IM client Pidgin, but you can add loads more. So, what's not to like? The price. Granted, Presto's $20 license fee won't break anybody's bank, but it feels a bit like sacrilege to pay for Linux--especially considering how many free variants are out there. Still, I highly recommend taking Presto for a spin, which you can do for a seven-day trial period. It's incredibly easy to install and totally noninvasive: Uninstalling it is as easy as uninstalling any Windows program. Presto is ideal for old PCs, low-powered netbooks, and slow-booting laptops. On a pokey desktop replacement, for instance, Presto loads in just under 20 seconds. I also installed it on an Acer Aspire One netbook. Boot time: 13 seconds. Shutdown time: 2 seconds. Beat that, Windows 7. Start Windows, download Presto (it's a big file, so it may take a while), then double-click the file to start the installation. When it's done, reboot your PC. Presto may load a bit slowly the first time out (by which I mean 30-45 seconds instead of 15-20), as it has to perform a few one-time configurations, but it should be much faster on subsequent boots. The OS should automatically detect your Wi-Fi adapter and any nearby networks. To connect to one, click the small network icon near the bottom of the toolbar (you can mouse over any icon for a description), then choose the network you want. Now you're all set to get online. 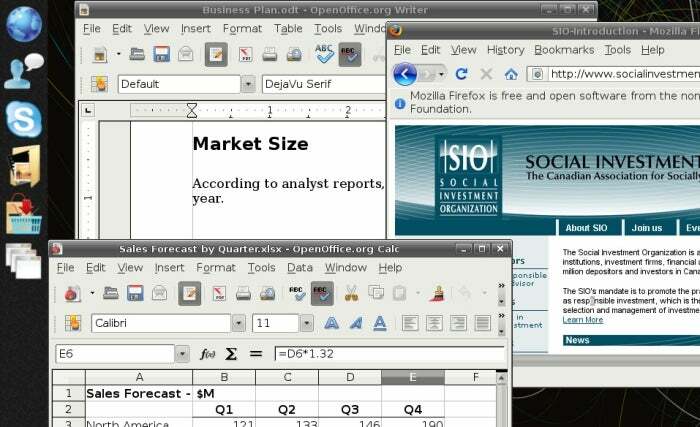 From top to middle, the Presto toolbar apps are as follows: Firefox, Pidgin, Skype, File Manager, and the Application Store, where you can download hundreds of additional programs and access two other preinstalled apps: OpenOffice and RealPlayer. As in Windows, you can cycle between open applications by pressing Alt-Tab. To shut down or restart your PC, click the big green power button. For starters, anyone accustomed to Windows will notice that there's no taskbar. So, how do you switch between running programs (or just see what programs are running)? Want to install new software? Click Application Store in the toolbar, then click the eponymous icon in the window that appears. Here you can find GIMP, Picasa, Thunderbird, and countless other programs--almost all of them free. To install anything, just click the corresponding green Install button. Presto can import bookmarks from your Windows version of Firefox: Just click the little Settings icon in the toolbar (just above the clock), then choose Import Bookmarks. However, I think you're better off installing Xmarks, which seamlessly syncs your bookmarks across all your Firefox installations. Press Ctrl-Alt-T to bring up Presto's DOS-like terminal window. Type xfce4-settings-manager, then press Enter. Click the system setting you want to adjust. That's it! Now go forth and enjoy your fast-booting, Web-friendly PC.